At 9:59 am I popped open my laptop. I had prepared for this moment by taking the required steps, which included passing two quizzes, twice proving my identity, and buying a bunch of Ethereum tokens. I was ready to exchange those Ethereum tokens for Civil tokens, abbreviated CVL. The Civil token sale went live at 10 am. 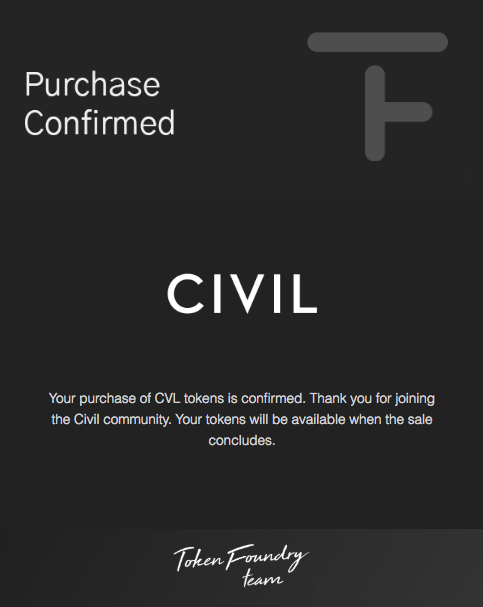 I went to the Civil site on Token Foundry and I clicked "buy." But there was no record that once there, those tokens became CVL tokens, or even that they will at some point in the future. The only proof I had was the "success" screen capture above I happened to snap because I planned to write this post. After reading so much about maintaining the security of my cryptocurrency wallets, along with the profoundly traceable nature of transactions on the blockchain -- the lack of even a "pending" transaction was a little odd. 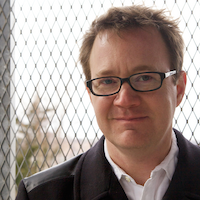 It was also the second time real money had seemingly vanished in the process. But I'm actually not concerned. Maybe that's silly, but one thing I've learned in this process is that the Civil folks have thought a lot about this system and this sale. Plus I have both the screen shot and a receipt that I sent Token Foundry a bunch of Ethereum. Of greater concern, might be that the sale won't go through at all if people don't buy more than $8 million in tokens by October 15. After exactly 12 hours the tally was $98,984. At that rate, assuming people buy 24 hours a day, I think Civil would come up a couple million short. I hope I'm wrong. I'd like to see how this experiment plays out, while also having a small stake in it.